hey girl, I also have 2 of YSL's duo eyeshadows but Im selling them in my blog sale because somehow i just can't make them work for me. Thanks for the swatches. i love how long lasting and rich their eyeshadow formula is. and i've test driven loads of eyeshadows, hehe. I have only one YSL palette and am totally in love with it. Wish I could get a deal on them too! 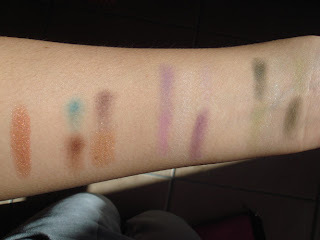 Thanks for the swatches! They look so pretty! 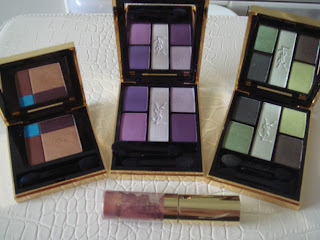 I've never tried ysl palettes, but these look nice! maybe I should get one, as I totally love palettes... btw, I think it's pretty cool that you're 25, and a mom, and so pretty! I have yet to enter into the world of YSL eyeshadows.. but this post is making me want to!! Simply just enter in the item in addition to produce great idea, far more contentment you'll receive. Goyard is usually a lesser known gucci replica in comparison with it is The french language inlaws, Hermes in addition to Louis Vuitton, although it is label happens to be extremely special models on this planet. In this article chances are you'll consult the reason. Goyard seemed to be to be a trunk machine with 1853, 1 year previous to Louis Vuitton, although over seventeen a long time soon after gucci replica. And it also seemed to be this malletier of the many aristocratic individuals with People from france, developing carriers in line with the regal colorings using their company crests. Goyard likewise states to obtain designed the primary company suitcasela malle agency en François. The most famous motif is usually a three-dimensional style, often known as this chevron, hublot replica watches is usually primary listed with 1892, and is particularly coated with some colorings. This stuff is usually a silk cotton, bed-linen in addition to hemp combine that’s lined having teeth Arabic resin-this ends up with a super lean, light in weight, in addition to watertight stuff. This model the moment evolved into obscurity, until finally Barney’s included the item into their windows from the beginning 2000’s. At this point louis vuitton replica are likely to fork out extra cash over this $1000 or higher charges to obtain the initials, some sort of crown, or maybe whipping of any coloration inflated independent tailored case. Although you will discover solely 14 outlets on this planet, as well as Takashimaya (Japan), Bergdorf Goodman, Barneys, this Peninsula replica watches in addition to Maison Goyard per se with People from france, or maybe this flagship with S . fransisco. Appears to be a bit fewer!